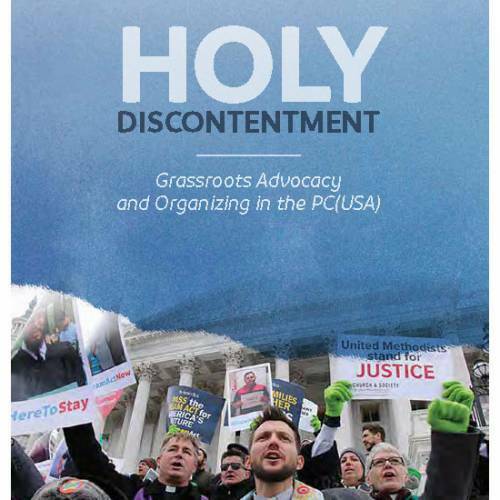 The Office of Public Witness (OPW), the public policy information and advocacy office of the General Assembly of the Presbyterian Church (U.S.A.), recently published an updated version of its community advocacy guide titled Holy Discontentment: Grassroots Advocacy and Organizing in the PC(USA). The resource serves as a blueprint for Presbyterians who wish to engage more fully in community advocacy and organize for just public policy. It can be downloaded here. The e-publication provides a comprehensive toolbox for current and potential advocates, offering specific directions and expectations around meeting with members of Congress as well as contacting them by telephone, direct letter writing and writing viewpoints to local print media. There’s also guidance on post-meeting follow-up strategies, effective social media interactions, hosting and conducting interfaith vigils, and faithfully participating in town hall events. The manual, edited by Nora Leccese, OPW’s associate for domestic poverty and environmental issues, also provides a context for community organizing by outlining the value system of each player in the power dynamic: the public, private and civic sectors. “We must deepen our understanding that in order to honor a higher power we must at times challenge the powers and principalities that govern our nation. This guide provides a foundation for how the Church can effectively engage when so much of creation is under threat,” said Leccese. Based in Washington, D.C., OPW staffers often visit national policymakers and their staffs, write letters and make phone calls to facilitate the church’s testimony and emphasize its social witness policies. The Office of Public Witness has an online action center that provides names and contact information for elected officials at capwiz.com/pcusa/dbq/officials. Gracious and loving God, you call us together as the body of Christ to love one another, serve those in need and proclaim the good news to all. Help us as a denomination, that we may not simply conduct business but spur one another on toward love and good deeds. Through Jesus Christ we pray. Amen.